The following has been excerpted from my book on money, Are You Worried Yet? Where Is Money Taking Us? (areyouworriedyet.com) I have changed it slightly for the present application. By looking at things with only one eye, we lose “depth perception.” It takes two eyes to see into anything with any depth. Perhaps by now you have already noticed that the Bible is pretty deep, in fact deep beyond any likelihood of human understanding, at least, this side of the second coming. Reading with two eyes can mean many things, but for the present I would like to examine one aspect of two eyed reading and understanding. What I want to say here is that we need to read about God with both eyes open, one focused on His Word as revealed in the Bible, and the other focused on His Word as revealed in the things created, Romans 1:18-20. If we go through life with only one eye open, we are clueless about the creation. If we read the Bible with only one eye open, we are bound to be religious. Jesus came that we might have life. Apparently the Pharisees were/are trying to get somewhere. The way we normally get somewhere is a “street.” Even back then, right next to the streets were “ditches.” The problem is, if you are trying to get somewhere with a blind leader, you wind up in the “ditch.” For now, it is enough to understand that a “ditch” is one bad, but close alternative to a “street.” We will take a closer look at a “street” in a moment, but first I would like to bring this into the twenty first century by saying a word about “parking lots.” They are also a close alternative to a “street.” Where a blind guide is likely to lead you into a “ditch,” a “one eyed jack” can see just well enough to get you into a “parking lot.” In either case, “ditch” or “parking lot,” you’re not getting anywhere once you get there. If you want to get somewhere, it’s a “street.” that you are looking for and should be on. It’s best if you have both eyes open when you are on the way. Did I mention that Jesus is “the Way”? 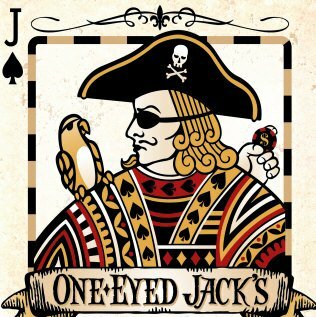 At first glance, it may look like a “one eyed jack” is a better alternative than a blind guide. The problem is you can’t really get anywhere with either one of them. Perhaps that’s why “church” buildings need to be next to “parking lots.” Jesus has opened up to us a new creation, and a new kind of a city, a spiritual city, and the “street” of this spiritual city is “pure gold, as it were transparent glass.”5 Keep in mind that a street is a way of getting somewhere. Even in a spiritual city, we need to get somewhere. In God’s spiritual city, “The New Jerusalem,” (Revelation 21:2) the way we get somewhere is love. And if the blind lead the blind, both shall fall into the ditch….So much for our two favorite Christian games…Simon Says and follow the leader! But my bible says BOTH fall into the ditch…not just the leaders! Teachers and students alike fill the ditches along the roadside, What vexes me is that perhaps the enemy intends to bulldoze them over and turn the ditches into mass graves!